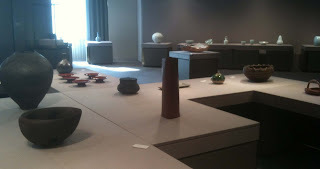 The Osawa’s 'slab' you are writing about intrigued me to go and see the exhibition today. 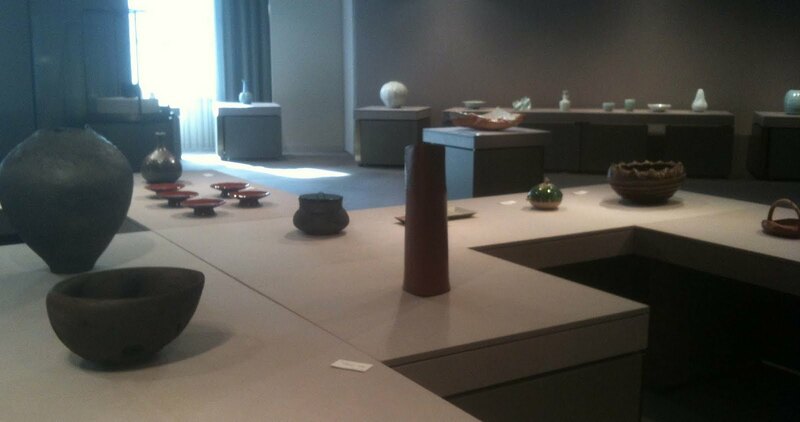 It was an interesting experience as only two women: Machiko Ogawa (小川・待子) and Shoko Koike (小池・頌子) contributed their works of art this year. I was particularly interested in the technique of making the 'slab'. Circling it a few times, I discovered that the artist, first, made a vase using the wheel, and then split it by cutting and tearing the piece. It seems to me, therefore, that there is a 'twin sibling', represented by the second part of the pot, somewhere there waiting to be discovered in the future. 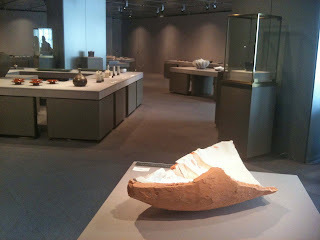 Looking from above, one could notice that only a half of the piece, weighting about 5 or 6 kg, has been flushed with glazing, but the sealed surface is sufficient to support a kenzan. 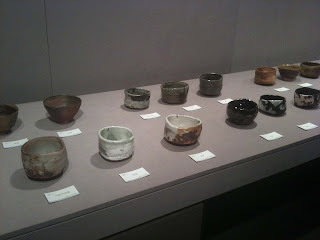 Besides, the pottery has a small flat inside on which it rests. An amazing piece of work. 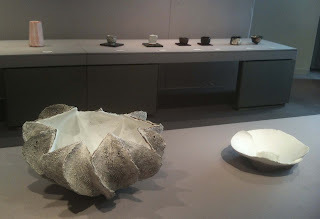 The second woman displaying her work was Shoko Koike. The artist comes from a well-established artistic family, yet, displays her distinctly unique style. 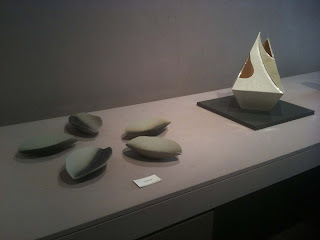 One of her 'The form of white' (白の形) pieces was sold already – missed on this one, as it was making a pair with a micro pot-chan being made in the image and likeness of the big, flower-like piece. As I saw it, both of them would make an ideal support to a sophisticated ikebana arrangement. The 'shell', on the other hand, seems to be a continuation of the artist’s current style. Also an interesting piece of pottery, though. Thank you for the hint and a brief introduction of the event.